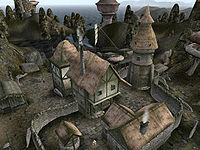 Dagon Fel is the northernmost town in Vvardenfell, situated on the island of Sheogorad. It is home to Nord fishermen, as well as a detachment of Imperial Legion guards. There is a tiny inn with warm beds and a few traders. The most interesting things in Dagon Fel are the three Dwemer towers outside the city. Strict laws prevent the trading of Dwemer artifacts taken illegally from the ruins. The southernmost is inhabited by a Necromancer and a few of his followers and the northern one is home to an Orc who maintains he fights best in his skivvies. The Inn The End of the World offers a trader with a few supplies, sundries and beds. The Savant Sarnir the Clerk can mark many places in Vvardenfell on your map, if you explore all his topics. A few merchants frequent the Renters Rooms. As the name implies, Greidil Half-Troll dwells in this house. It contains nothing notable, although a table and a shelving unit inside have been overturned. Additionally, the shack incorporates two doors, but only one provides a means of access, however—within the interior of the house, three crates and a barrel block one of the doors; it is not possible to gain access to the house through here (unlike the other door, this door is labeled on the outside as "Shack Door"), and attempting to do so will provide the message: "This door refuses to open. It feels as though it has been barricaded on the inside. You'll have to find another way inside." Interestingly, you can leave the building via this door (which is labeled accordingly on the interior side), but this is likely an oversight. Dirt roads leading east traverse the island, past several Dwemer Ruins. 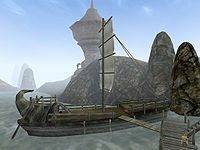 The Arrow at the docks can take you to Khuul, Sadrith Mora, Tel Aruhn and Tel Mora. The Stronghold Rotheran with its Propylon Chamber is southwest of town. 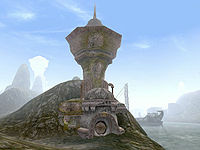 The Vacant Tower houses the highest trainer in Medium Armor, Khargol gro-Boguk. He is also the Master Trainer in Unarmored. The Dwemer ruin of Mzuleft. 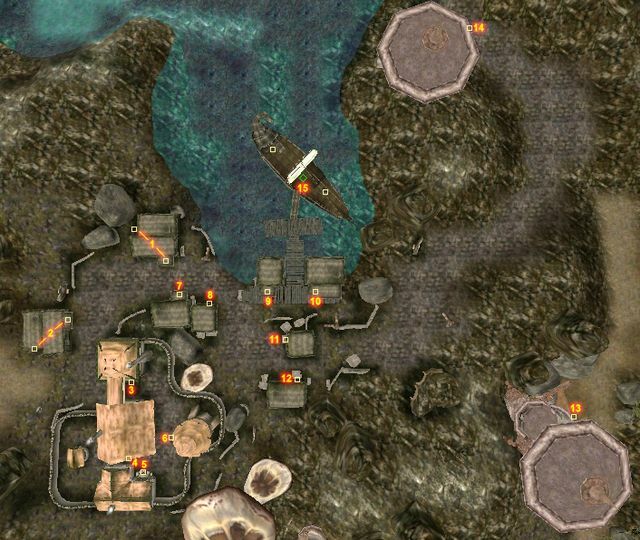 The Shrine of Malacath, located to the west, is a major point of worship for Orcs. The Tower of Sorkvild the Raven has some interesting loot, namely the Masque of Clavicus Vile and a Daedric Dagger. A weary vampire in Drethan Ancestral Tomb holds a nice ring. The tomb is south of town, east of the Stronghold Rotheran.